This is something new I’m going to try on this blog, a featured author. I’ll be doing this every month with a new author and just talking a bit about them and their work. Why? Because I love reading posts like these so I decided to try my hand at writing them. To kick things off I thought I would start with my favourite author: J.K. Rowling! Even if you haven’t read one of her books you probably know who J.K. Rowling is. At the very least you’ve heard her name. But who is she? Where did she get her start? Joanne ‘Jo’ Rowling was born on July 31, 1965 (The same day as Harry Potter) in Yate, Gloucestershire, England. Her father was an aircraft engineer, her mother a science technician, and she has one younger sister, Dianne. She started writing from a young age and in 1990 dreamed up the idea of a young wizard boy on a train ride to London. Rowling taught English for a period of time in Portugal in night classes and wrote during the day. She has three children: Jessica (with her first husband), David, and Mackenzie (with husband, Neil Murray). Rowling used a lot of real life influences while writing Harry Potter. The death of her mother greatly influenced how she wrote Harry’s feelings towards the loss of his parents. Not only that, but for a period of time Rowling was clinically depressed and it was this period that inspired the dementors. 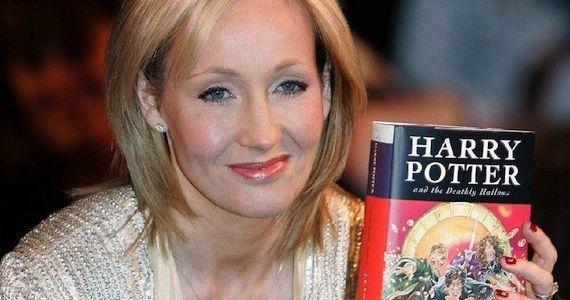 Harry Potter was rejected by twelve publishing houses when she first sent it out, but was eventually published in 1997 by Bloomsbury. Despite the initial reaction, it seems there’s a good chance J.K. Rowling already knew how the entire series would end as it’s been said (meaning I’ve read on the internet and seen in interviews, but can’t find the sources right now) that she knew there would be seven books and had already written the end of the seventh. Harry Potter isn’t her only work. Since the series finished she’s written The Casual Vacancy (I have, but haven’t read yet) and has written other novels under the name “Robert Galbraith”. But this is all just the basic stuff. 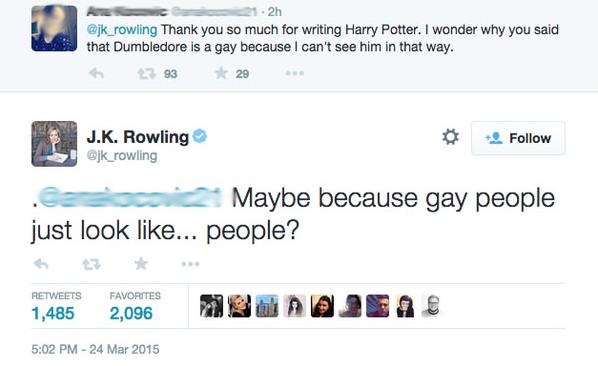 What you might not know is that J.K. Rowling is the Twitter Queen. Or that she is a sassmaster and actively engages in debates about things she cares about online. Seriously, if you don’t follow J.K. Rowling on Twitter you are missing out. This is just one of the little gems you will find if you follow her. Not only that, but you’ll also be able to see the humorous and wonderful interactions with the Harry Potter cast. 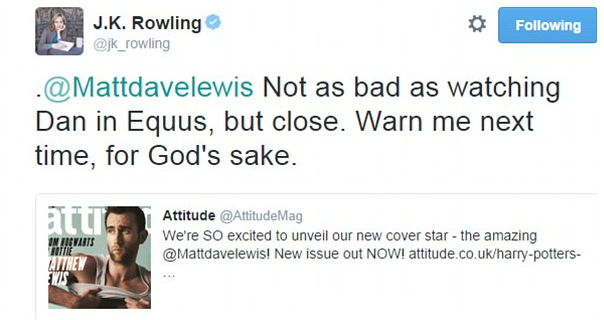 Her tweet to Matthew Lewis when he did some scantily clad photos was particularly wonderful. She has had a major influence on many people. One individual in particular was Evanna Lynch (Luna Lovegood). Lynch wrote to Rowling and told her about her struggles with her eating disorder and Rowling encouraging words back assisted in Lynch finding the strength to not only fight back, but audition and get a role in the film series. J.K. Rowling has also been a huge influence on me. I’ve never met her (one day), but I can say completely, 100% that I would not be the same person I am today. Not only is Harry Potter a major part of my life, but she’s a big reason why I started writing. Who knows where I’d be if it weren’t for her. So this was my first Featured Author post. I’m liking the idea, but I may try and change it up a bit in future. Unfortunately I don’t know any of the authors I’m talking about so most of my information has to come from the Internet or my other thoughts. Who knows, maybe one day I’ll be able to talk to one of the people I’m talking about. Maybe I’ll interview one of them for this blog.